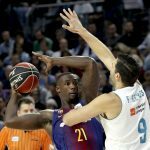 On Sunday fans of Spanish hoops were treated to a special game in Round 24 action of the Liga ACB. 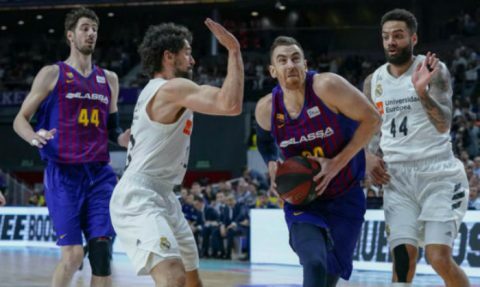 There were several exciting games on tap but none drew as much attention as the latest chapter of the El Clasico between Real Madrid and FC Barcelona Lassa. 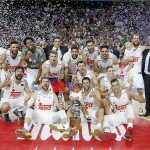 Real Madrid hosted their long-time rivals and after the chips fell, the current Liga ACB leaders emerged victorious, 76-82. As always, both teams came to play and play hard for honor, pride and the solo league leadership. In the end, the game boiled down to defense. Neither team was able to run away with a huge lead, at least nothing that was not able to throw the game out of control. 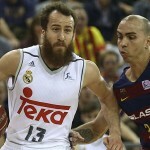 Sergio Llull was off his game and was limited to scoring just 13 points and dishing out two assists. Real Madrid’s recent success can be attributed to his improved play. 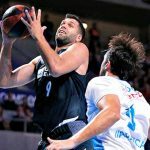 So, it’s no big surprise that his lackluster night translated in his team’s inability to close out the game with a win. Jaycee Carroll was the team’s top scorer with 15 points. 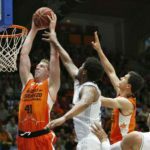 Thomas Heurtel led the charge for Barcelona with 15 points on 6-of-7 shooting from the field. He heated up on offense at just the right time. He helped spark a run during one of the key swings in the game. Kyle Kuric and Victor Claver added 13 and 12 points, respectively.